Abstract: Seasonic's flagship power supply is its S12 600 and computer enthusiasts have put this bad boy in the same category as PC Power & Cooling, Fortron Group and Silverstone units, that's some pretty select company! One thing that's great about the computer hardware enthusiast community is that in general, newbie computer users can get excellent advice. If you don't believe me, post a n00b style question about power supplies in one of the various computer forums online. Something like "what to buy", "what to look for" or whether generic power supply's "will make the cut" would be good and you will be steered in the right direction by experienced users. In the enthusiast world, no one benefits from giving misinformation or bad advice. With the increased power demands of modern computers, there have been lively debates in about what type of power supply is needed. 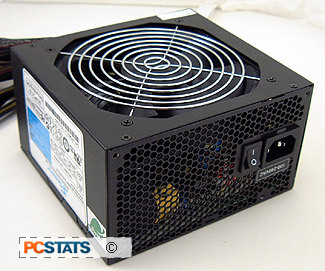 Remember the PC Power & Cooling 1kW power supply that was introduced a while back? Well with Quad SLI and multi videocard systems, 1000W power supplies might be recommended in the near future! At the moment though, the best a DIY'er like me or you can do is run two videocards inline and we can get away with a power supply that is a bit smaller. Seasonic might not be the first name you think of but it should be near the top of the consideration list. In the last couple of years Seasonic has flooded the market with a large amount of quality power supplies. Seasonic did not spring up over night and has over 30 years of power supply manufacturing experience! Yes that's right, Seasonic makes its own power supplies and does not remark higher standard generic models. Seasonic's flagship power supply is its S12 600 and computer enthusiasts have put this bad boy in the same category as PC Power & Cooling, Fortron Group and Silverstone units, that's some pretty select company! The Seasonic S12 600 is SLI certified, that itself is already like a badge of honor and it is fully ATX 2.0 compatible. The Seasonic S12 600 retails for $171 CDN ($155 US, £83 GBP) but that's a pretty aggressive price for a top of the line PSU. The Seasonic S12 600 is standard ATX size at 139 x 150 x 85mm which is good news if you're using a tight case. Many of the enthusiast class power supplies that are 500W+ are physically larger than the Seasonic S12 600 which can cause space restriction problems. Please note that the Seasonic S12 600 only has one exhaust fan so it's vital that it is not blocked (like when installed upside down). According to the Seasonic label the +3.3V line can deliver a maximum of 30 amps while the +5V rail can deliver 30 amps as well. Total output for the +3.3V and +5V rails are 180W. There are two +12V rails in the Seasonic S12 600 and each can deliver a maximum of 18 amps with total power output of 432W. While the various voltage rail ampere ratings might look a bit low, it's important to remember that Seasonic lists sustained values. Seasonic is so proud of its power supplies efficiency ratings that it's blatantly advertising them and the S12 600 is rated to have an efficiency rating past 80%! 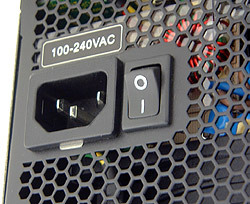 The Seasonic S12 600 powersupply uses Active Power Factor Correction (A-PFC). A-PFC circuitry eliminates the need for an external voltage level switch (115/230) on the powersupply since it works with a wider voltage range (115VAC of North America to 230VAC of Europe) by default than PFC-based powersupplies.